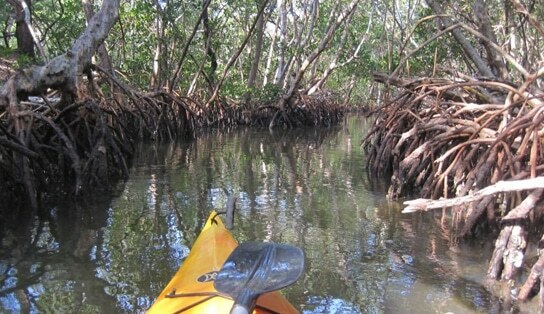 Kayak Eco Tours through the Mangrove Tunnels on Lido Key, are best, when you are accompanied by a professional guide. Small groups of paddlers are preferred by most people because it is easy to stay together and enjoy each other’s company and share the experiences and Kodak moments as they come along. The Sea Life that makes your kayak Eco-tour most memorable, may include Manatees, Dolphin, Ospreys, Cormorants and Pelicans. These top five creatures are most frequently seen on the mangrove tunnel tours at Ted Sperling Park on South Lido. In Addition to seeing wading birds and marine mammals you’ll have an opportunity to learn how to paddle a little better as you navigate through areas of the mangrove forest and mangrove tunnels that twist and turn and sometimes carry you right along as you simply take in the sights floating through the forest on your exotic mangrove tunnel tour. Before you go afloat; we will fit you with a comfortable and adequate PFD, personal flotation device so that we all know that should you need it — you have it, or have it on! Swimming is not a requirement for going kayaking but an acceptance that the water is there and you could overturn and need to stay afloat — is important for both paddler and guide. We will teach you how to hold the paddle correctly and adjust your seat and back so that your foot braces can be reached and relied upon for balance. Being outfitted correctly and not sitting on top of a kayak that you are too big for; keeps capsize occurrences to a minimum. Your guide knows how to manage and maintain a group of reasonable size. Overturns don’t happen often with Island Style Watersports clients because we put you in kayaks that are designed to be very stable and unlikely to tip over. In the event that a tip over occurs while paddling the mangrove tunnels, you will just stand up and wait for help getting back into your kayak to continue your trip through the enchanted mangrove forest, a little bit wet. The mangrove tunnel tour on lido beach is the most comprehensive tour offered in Sarasota. Just because the mangrove tunnel tour includes both the mangrove tunnels and some open water areas you’ll get lots of experience paddling a variety of conditions and using the easy kayaking methods that Laurel Kaiser teaches. In the open water area, which is still very protected, you may see dolphin and manatee and this is where your good paddling technique will help you to relax and enjoy the distance, taking in every opportunity to encounter sea life of every kind on your kayak Eco-tour which may take you around Otter Key or across the grass flats of Sarasota Bay, in hopes of seeing manatees as they come up for air while grazing or swimming from place to place. We recommend comfortable clothing and shoes (if you wear shoes). A hat is a great thing to have on when the sun is high! Cool water is supplied to paddlers on all kayak Eco tours and there is a communal wash station at Ted Sperling Park for desalinating after your trip and before setting off for a much anticipated lunch or dinner. The lido key kayak tours that we conduct are scheduled for your convenience and for optimal paddling and wildlife viewing conditions. You schedule your kayak tour with Laurel or another guide and we greet you at the launch site at a designated meet up point so you aren’t wandering the park trying to find your outfit! Island Style’s Kayak Eco-tours are not like amusement park rides where the ride fills up and takes off again and again. Standing in line and waiting for your turn to get in the water while sixty or more kayaks are being launched; is not what we do. We aim for least crowded periods in the morning and afternoons and we conduct our tours so that your experience is fast and efficient at the launch site.